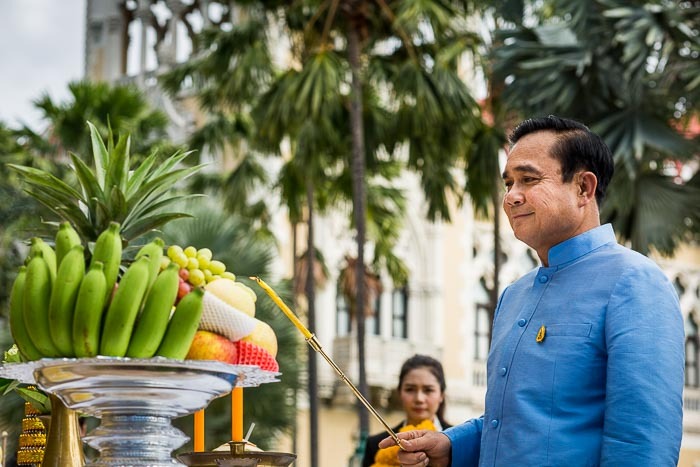 General Prayuth Chan-ocha, the recently appointed Thai Prime Minister, prays at a Spirit House at Government House. Thailand's new Prime Minister, General Prayuth Chan-ocha, met with his hand selected cabinet for the first time this morning. 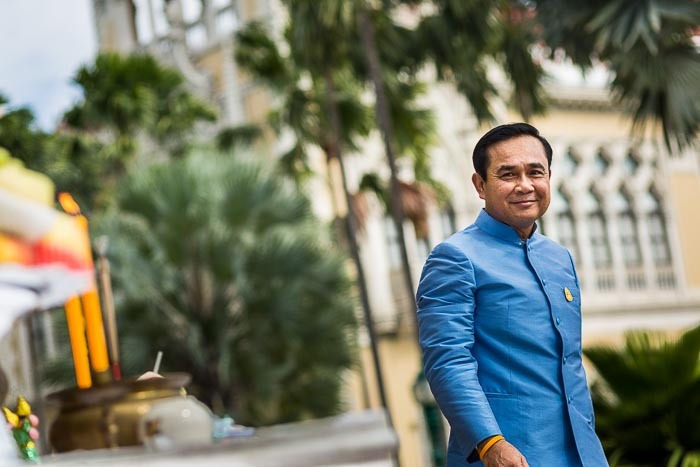 Prayuth was unanimously selected to be Prime Minister by the National Legislative Assembly, the parliamentary body he personally appointed after he took power in a coup in May. The cabinet, which he also appointed, is made up largely of generals and technocrats who support him. Prayuth, flanked by security officers and aides, walks out to the spirit house. 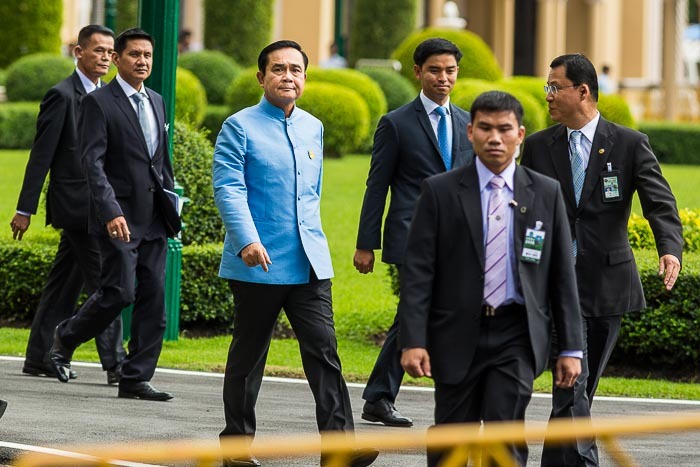 Before the meeting PM Prayuth walked out to a spirit house near the main gate of the Government House complex. He lit some incense and made merit before walking over to the cabinet meeting room. Gen. Prayuth lights candles during his prayer at the spirit house. The whole thing took about four minutes. The General / Prime Minister walked out, lit candles and incense, prayed quietly and walked back to the cabinet meeting. There were tens of Thai photographers and dozens of TV crews there. Cameras started clicking as the General walked in and went nonstop until the General left. 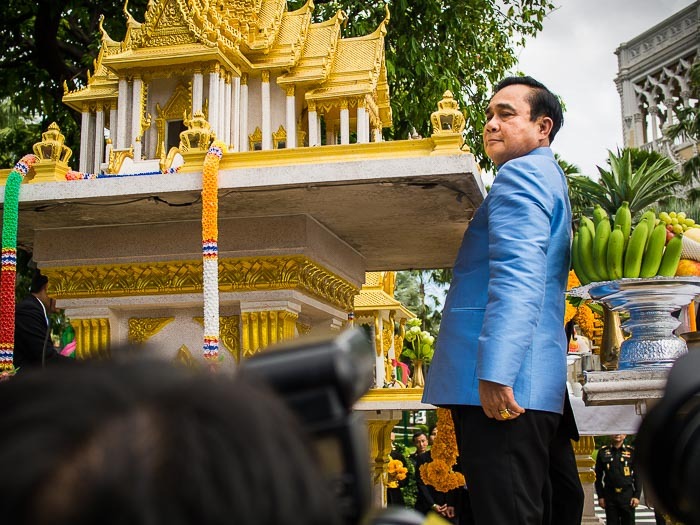 Gen. Prayuth squeezes around the spirit house. The only "real" moment (and it wasn't much) of the four minute event came when General Prayuth tried to walk between a small alter and spirit house. Other than that it was tightly scripted and executed perfectly. General Prayuth walks away from the spirit house after praying. 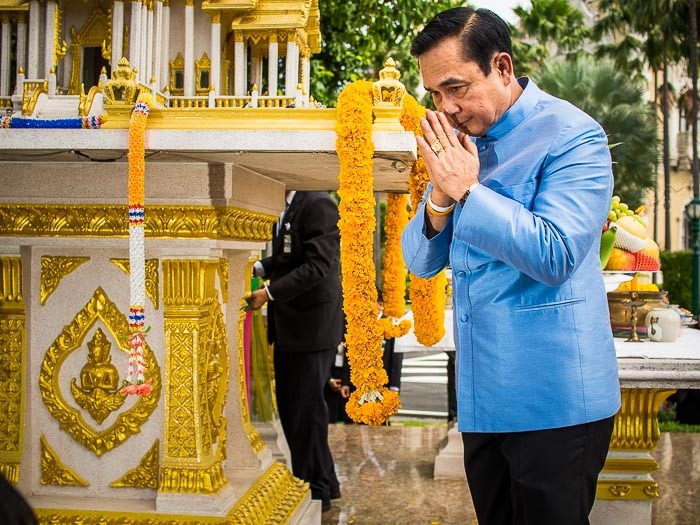 There are more photos of General Prayuth praying before the cabinet meeting in my archive or available from ZUMA Press.